Complete satisfaction at every step of the home building process is the objective at DeBoer & Gabriel Builders. 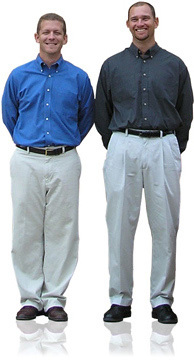 Co-Owners Jason DeBoer and Jeff Gabriel both worked in the construction industry for many years before combining their talents and experience together in 2002 and forming DeBoer & Gabriel Builders, Inc. Jason is originally from Florida, while Jeff is a life-long resident of the Burlington and Elon, North Carolina area. As local custom home builders, Jason and Jeff realize that a family’s greatest investment will be construction of their home, and can help make the undertaking of such a huge project a pleasant and fulfilling experience. DeBoer & Gabriel Builders has built a wide array of homes based on a variety of different plans for their clients. For a sample of their work, visit the Gallery section. And while a picture is worth a thousand words, testimonials from some of those satisfied homeowners are even better. DeBoer & Gabriel Builders has carefully crafted a reputation for fairness, efficiency and quality by working with the customer’s plans, staying within the homeowners’ budget and producing a quality custom built home.